On the TekiNerd server pages, we covered how to install Windows Home Server (32 bit edition) on top of a VMware ESXi 4.0 based server (here). The ESXi installation has since been upgraded to ESX 4.1. Let’s now turn our attention to some of the neat system backup features that come for free now we have Windows Home Server (WHS) running on ESXi that are not available in a standalone WHS system. As most WHS users know, data directory backup is already handled nicely in WHS with built in duplication (a form of data mirroring) and user/shared folder backup capability to a local USB disk drive or networked drive if using one of the available add-on programs. One of the short comings of the original 32 bit Windows Home Server for me was the lack of any built in tools to backup the primary WHS boot drive. While using a RAID 1 boot drive would protect me from a disk drive crash, it doesn’t offer the capability to “rewind” back to a former backup copy to fix a system drive corruption issue. To compound the problem, my favorite Windows disk image backup utility doesn’t support server based operating systems, presumably because they have a higher cost enterprise class version they sell into the classic server markets. So for most of us, the problem remains on how to easily backup and restore the primary boot volume of the WHS server or upgrading the entire server hardware without losing the current WHS configuration. The good news is that backup and restore for a primary boot drive becomes significantly easier when you are running as a virtual machine. Taking a snapshot copy of your current working home server is like taking a photo of the current state of your virtual WHS boot hard drive … almost. While no physical copy of the drive is being made, enough information is captured in a new file to ensure that you can effectively backtrack from a future point back to the point in time when you took the snapshot. Using snapshot, you can in effect ‘rewind’ your WHS server to an earlier point in time really fast (as in minutes). More importantly, the snapshot itself only takes minutes to complete. The benefit is just the same as doing a complete backup. If you accidently deleted a file, it reappears if it existed when you took the snapshot. If a virus attacks your home server boot drive for any reason, you can rewind back to an earlier point in time prior to the infection (losing whatever changes you’ve made of course since then on the primary boot volume only). Snapshots in large Enterprise storage systems have become an almost necessary way to do business given the sheer amount of time it now takes to backup system data volumes based on older file or block copy based techniques. A word of caution here. Snapshots are really a great tool and should be used whenever you’ve made minor to semi-major changes to your home server and also periodically. However, as all the data is still stored on the same physical hard drive right next to the main boot image it is not a substitute for a full system backup and you still need to protect from a complete physical hard drive disk meltdown. For enterprise servers, RAID 1 helps with this and certainly doable for the more acute TekiNerds out there, but for the smaller guys at home with less 24/7 stringent needs or RAID know-how, the more cost effective approach is to do a simpler file copy approach as we’ll show later for the full system copy. Snapshots are easy and fast to do. 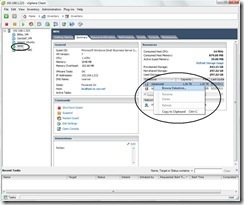 Simply log into your vSphere console from your laptop or desktop PC which connects you to the VMware ESXi portion of your physical server running underneath the Windows Home Server (see the other post here). 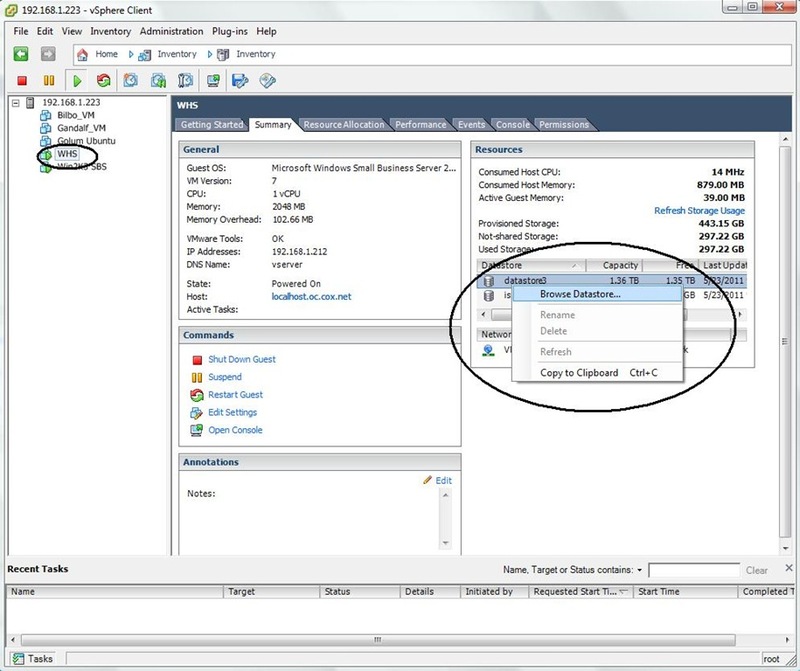 In this example, my virtual home server is called ‘WHS’ which shows up on the left hand pane of the vSphere window once you expand the virtual server inventory list. Substitute this with your own name if different. Right click on the WHS virtual machine and you’ll see Snapshot (ESXi v4.1 shown here) show up as one of the options. Simply select the ‘Take Snapshot” option and provide a name for the snapshot (I usually include the date) and any comments as required. 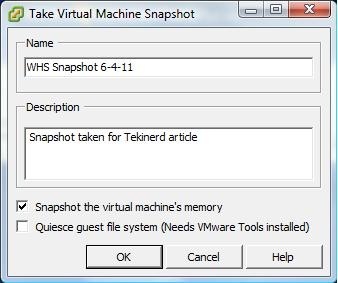 Snapshots are best performed when the system is actually not doing anything to ensure consistency of all the files, hence select the ‘Quiesce guest file system’ option also to make sure all is stable and quiet if you have VMtools installed. If unsure, you can check if they are installed by looking at the WHS Summary tab in the General summary box for your virtual machine, where it should say “VMware Tools OK”. 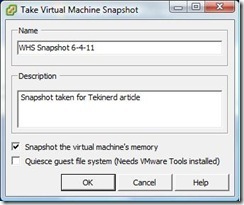 If VMware tools are not installed on the WHS server, then either install by right clicking your WHS virtual machine and select Install VM Tools via the Guest sub-menu and follow the instructions if any (though its fairly automated for Windows clients). Alternatively, put the WHS into standby mode using the Power/Suspend option before you do the snapshot. I’ve performed snapshots without suspending and they appear to work ok, but it’s safer to completely pause the system in case a snapshot is taken during an important file change that may be occurring during the snapshot. (Note – larger enterprise systems use special software drivers to help ensure consistency, flush and pause important storage I/O during a snapshot, etc). Once you’ve done several snapshots, the Snapshot manager may be used to view the different saved points in time. Restoring your WHS to the earlier copy is simply a matter of selecting the appropriate snapshot you created via the Snapshot Manager and using the GoTo button to revert back. It takes less than a minute to revert back to the earlier time, though the network connections may be disrupted for a few minutes longer as everything comes back on line. Just to make sure it was working correctly, I created a snapshot and using Remote Desktop Connection, logged into the WHS server to create a simple “test.txt” file on the WHS desktop, reverted back to the earlier version via the Snapshot Manager to make sure the file had gone as it hadn’t existed at the time of the earlier snapshot point. Note, snapshot only works on your primary boot volume, NOT the data directories or additional volumes mounted on your home server. That is if you delete a file in the Public shared directory, it’s gone… zapped. So snapshots are for your primary boot volume and WHS configuration only. Use your conventional WHS data backup utilities via the console interface from your desktop or one of the third party add-ons to get full coverage for data also. Snapshots are great for capturing changes to the system configuration and quickly reversing a situation where the WHS operating system gets corrupted, you accidently delete an important system file or your system simply starts to play up due to some weird misconfiguration or tinkering. However, as said earlier, it is not a complete restore vehicle so if your hard drive dies, your virtual machine dies with it. This is where doing a full file copy based backup comes in. VMware ESXi uses it’s own file system to store your virtual WHS system which can be handled like regular files if done properly. 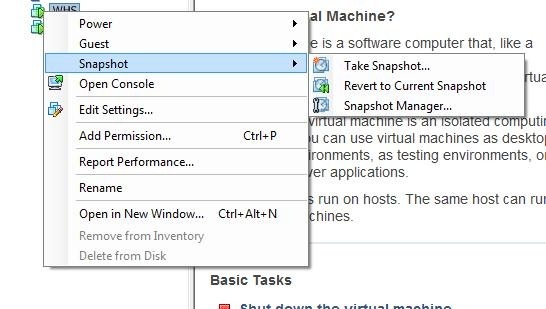 To make a complete copy of your system as before in the snapshot procedure, select the WHS virtual machine under vSphere but this time go to the Summary tab visible in the main window (with WHS virtual server selected on the left-hand pane and second tab along on the right-hand pane). Right click on the datastore listed at the top of the list in the Resource window as shown in my summary info (click on the picture to enlarge). In my case, it was datastore3. 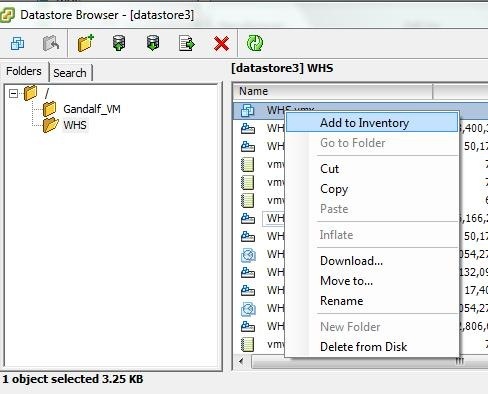 A small window appears allowing you to browse the datastore that the WHS virtual machine is associated with. This is not the only way to get to this information, but come in via this method ensures you’re looking at the right datastore associated with your virtual WHS and avoids messing up other virtual machines if you have them. A new window should open up and show all the individual directories and data files ESXi has created on this datastore as part of your virtual machine. Note these are normally invisible to any of your network PCs or virtual servers and are totally private to the VMware ESXi environment. Select the WHS directory and you will see a long list of files appear which contain all the ESXi working files for your WHS virtual machine, including the snapshot files we created earlier. 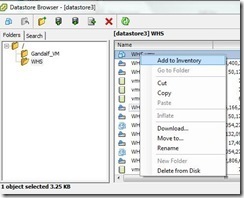 To download, select the whole WHS directory in the left pane and press the small stacked disk icon with the green arrow pointing down to bring up the download screen (tip: right click the same icon and select ‘show text on bottom’ to add the description of what these icons are to the menu bar). You will be promoted to select a directory on your local PC (i.e. laptop of desktop) to store the complete WHS folder which creates a complete copy of your virtual machine. Though not essential, for the same reasons stated earlier for snapshots, it is strongly advised to take the WHS server offline during this procedure. This also helps if you have to do a complete recovery as described below onto a brand new ESXi server. There are several cases where you’ll be needing the full image backup of the home server. This is where the power of VMware ESXi (or other hypervisors) really shines. As all the hardware and other I/O drivers installed during the Windows Home Server installation process are virtual and talk to a hypervisor, it no longer matters exactly what the underlying hardware looks like as long as it’s VMware ESXi compatible. So transferring to a totally new piece of server hardware without losing your home server configuration is now possibly and easy, just potentially time consuming due to the size of files involved that need to be transferred or copied. Further, you can easily move the entire virtual machine onto a different hard drive inside the ESXi server without affecting it’s configuration. I’ve already encountered a situation where I wanted to consolidate several virtual machines including the virtual WHS onto a larger, single 1.5TB disk drive I installed after the installation. 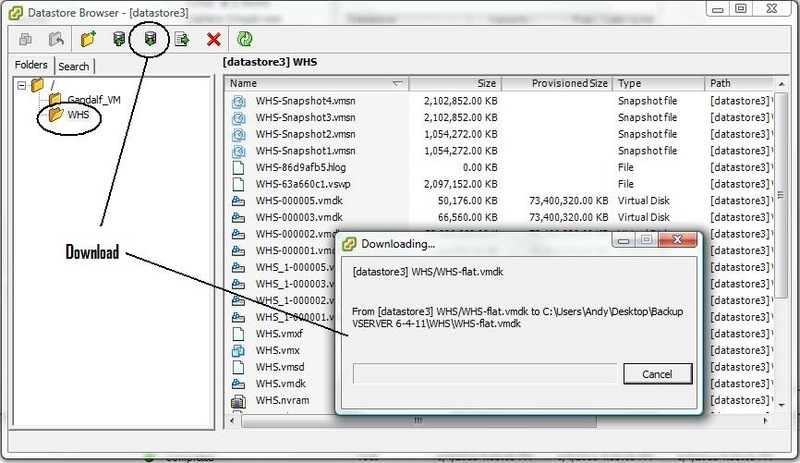 As shown above in the full image copy case and also visible in the download screen show above, the two other options available when browsing the datastore containing the WHS virtual files are to upload and move to another location within the same server. Not quite as elegant as the full blown vMotion capability of the enterprise VMware solution, but certainly not bad given it’s free. So for the case where I’m upgrading to a completely new hardware server with faster CPUs, more memory and from say a completely different vendor to my current machine, the process just got a whole lot easier. To transfer to my new hardware, I simply install VMware ESXi onto the new hardware, upload my saved WHS image to a newly created directory on one of the local datastores and re-introduce the WHS into the new ESXi configuration’s inventory. To add back into the inventory list, once all the files have been copied back, display the individual files within the WHS directory and right click on the .vmx file (in this case, WHS.vmx) and select ‘Add to Inventory’. This will add the new machine back to the active list of virtual machines for the new ESXi server and presto, you’re back in business. Usually, VMware will ask if the virtual machine is moved (select this usually) or copied so it can reconfigure the networking and other virtual devices correctly. Other than the initial copy or transfer time, this usually takes very little time to become active. The last thing to be careful about when moving to a totally new machine is ensuring that the same physical data hard drives containing the data are also transferred or copied over and setup in the same way they were before, otherwise WHS will not see it’s old data and user directories. In my case, the data has a mix of a local directory storage on local drives and part of an iSCSI device, so a second step of moving the datastore containing the local data disk as well as reattaching the iSCSI storage to the new server will be necessary an exercise I’ve yet to verify works without too much trouble.